Our testing lab was created to allow the Middle Tennessee community access to the same technology used by professional level organizations and in research applications. We also provide a custom-built client portal, meaning that you can track your progress across all our different testing mediums and access a complete history of past test results with a simple log-in. 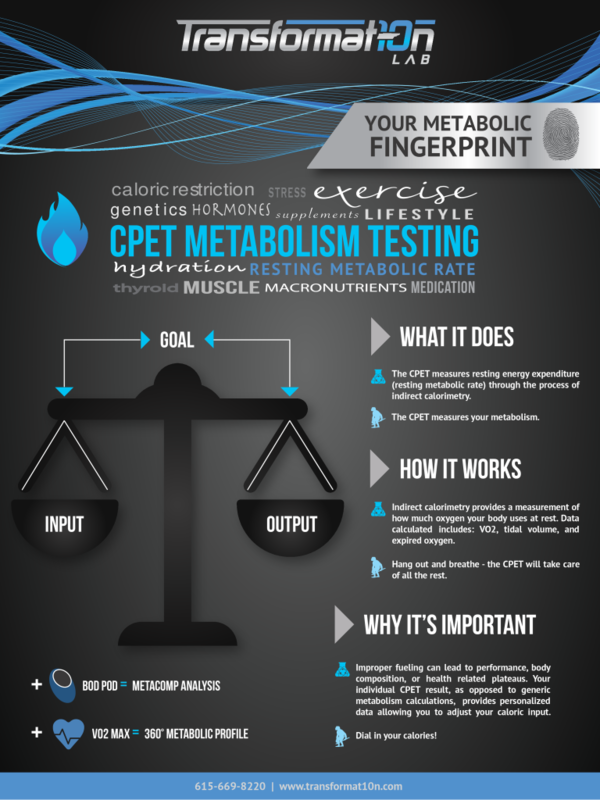 The Quark (CPET) indirect calorimeter measures oxygen consumed and uses that data to calculate the participant’s resting metabolic rate. This 20-25 minute test helps identify your individual metabolism and screens for abnormally fast or slow metabolic rates not identified by generic estimation formulas. Understand their caloric demands (how many calories their body is burning daily). Dial in a new nutrition program – specifically fat loss or muscle gain. Test your fitness! VO2 max testing guides participants through a gradually increasing treadmill workload to determine optimal heart rate training zones. Performed using the state-of-the-art OMNIA software platform used at the highest levels of sports performance research in both and academic and field study. Learn what fuel sources (fat vs. carbs) your body is burning during exercise. Determine anaerobic threshold and VO2 Max. Dial in endurance training and fueling for race day. 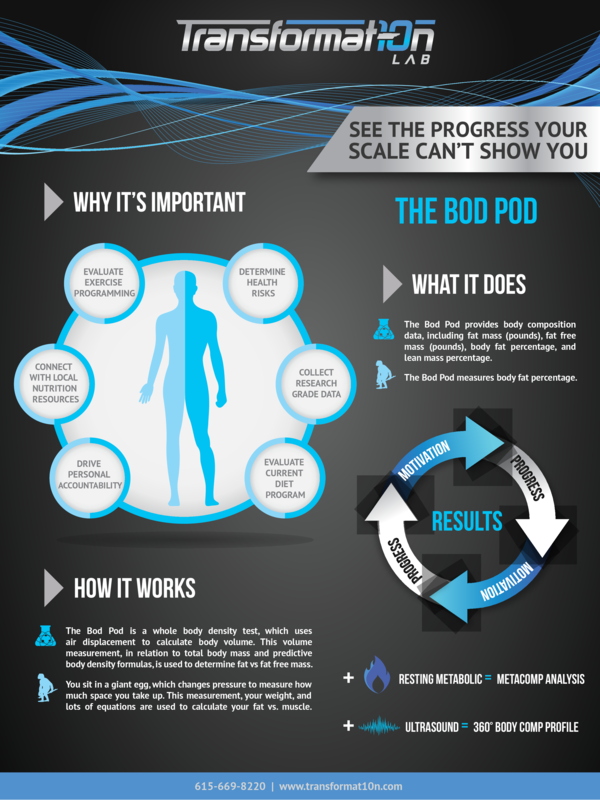 The BOD POD uses air displacement technology to provide a highly accurate body composition assessment. The POD’s ability to identify small changes in both body fat and lean body mass makes it an ideal tool to track progress and measure the effectiveness of your exercise/nutrition routine. The best part? A Bod Pod test takes only about 5-7 minutes and does not involve x-rays or getting soaked. Determine body composition via whole body model. Go beyond BMI for a health risk screening or assessment. Track progress on a new exercise/nutrition routine. Lose fat — not weight! Advanced camera, depth sensor, and image recognition technology combine to creates a virtual 3D avatar of the body in a 30 second scan. Quickly track key circumference measurements and compare scans side-by-side to see body change over time. Track visual progress on an exercise/nutrition program. Calculate circumference measures quickly and accurately. 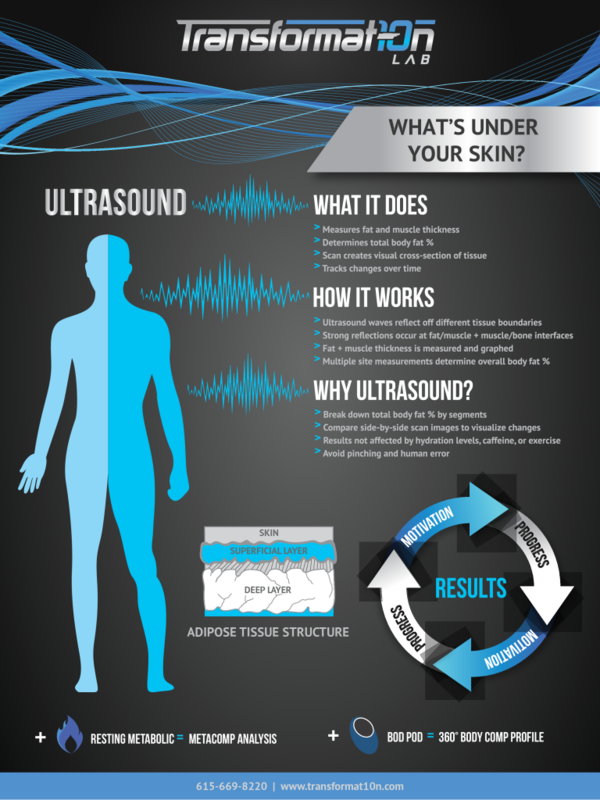 Ultrasound waves measure and map fat thickness at key site points on the body. This test provides a segmental breakdown of body fat and the ability to visually track changes over time with side by side scans. Determine body composition via multi-site model. Measure changes in fat thickness or distribution. Improve accuracy over skinfold calipers. Evaluate progress on an exercise/nutrition routine.